…They might just knock your socks off! Their project for humanities class had to have something to do with the ancient Greeks.As Newsradio 780’s Mike Krauser reports, their teacher couldn’t believe it. …”They said they had a great idea, but they wouldn’t tell me what it was,” he said. 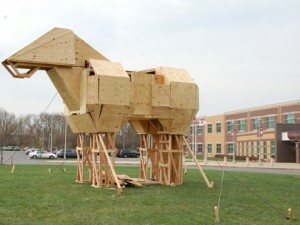 What they did was build a giant Trojan Horse, which, according to Greek mythology was used to sneak soldiers into the city of Troy for a triumphant battle. They built it in senior Sergio Aguilar’s yard, and then moved it right in front of Marengo Community High School….It’s 17 feet tall and 22 feet long. Up to 12 people can fit inside. 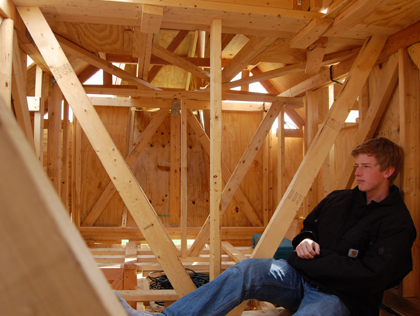 It was built of wood, and construction was funded with donations and some unused cash from a class trip.